Big bathroom sinks may be luxuriously customized for two or more users. The luxuries of space can be expressed in many different ways, including big bathroom sinks. I find big sinks especially appealing. Cast concrete and solid surface materials are popular materials for big bathroom sinks because they can be fabricated to specification and they have sleek, modern looks. In a Massachusetts beach house, Hutker Architects built an elegant modern bathroom for a client in the second-story master bath. 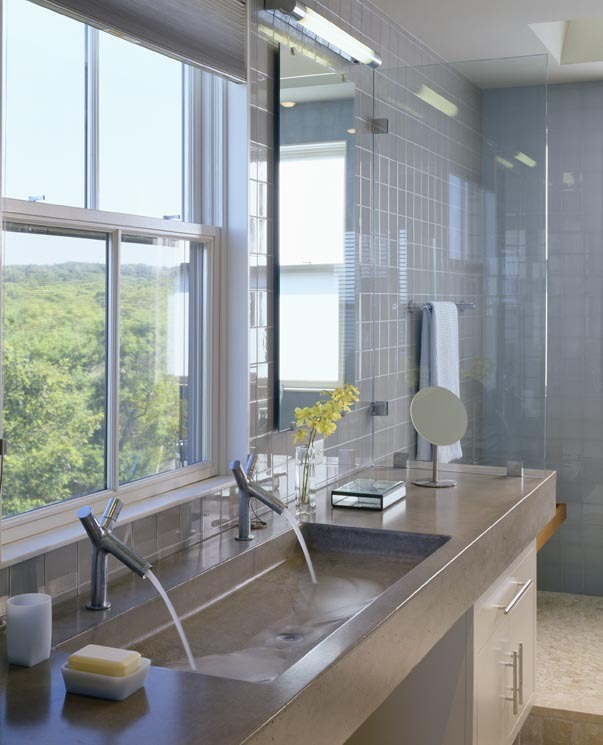 The double wide trough sink spans the width of the window and has a shallow basin served by a pair of deck mounted, Hansgrohe Axor Stark two-handle lav faucets, which lend a whimsical modern vibe to the classic serene space. Even larger is a four-faucet sink in the ladies’ room at the Frederic Fekkai hair salon in New York City. Fabricated from solid surface material it is super shallow — the basin simply tilts downward toward the linear drain in back. With a quartet of wall-mounted faucets this is a splasher but it’s interesting to see how the separate slab inside the “trough” is angled. 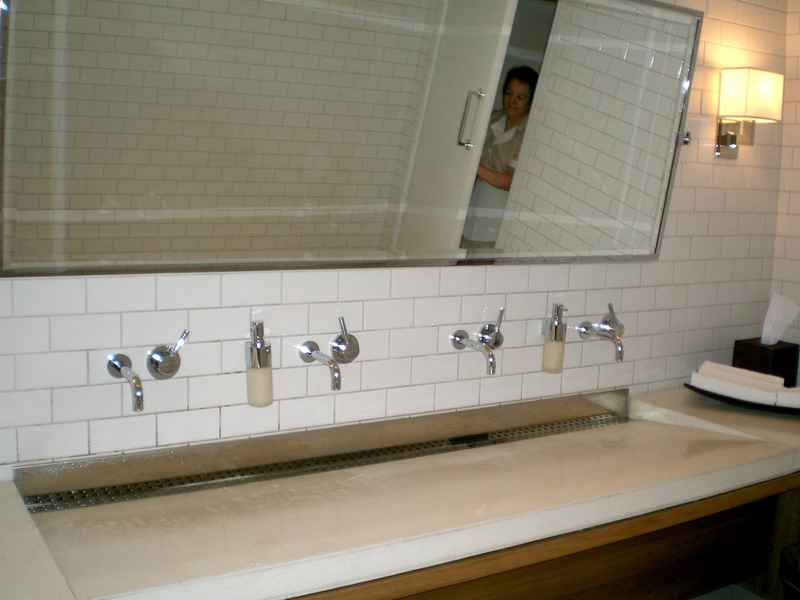 The size accommodates multiple users and it would be equally effective if there were only two faucets. But it also illustrates how minimal a sink need be. A commercial sink that supports multiple users is not much different than a sink at home. This one is far larger than anything I’ve seen in a master bath. But it also is an example of how often advanced designs for big bathroom sinks in restaurants, bars and other business can be successfully adapted to home use. Scaled down, a sink like this could serve any powder room or guest bath. 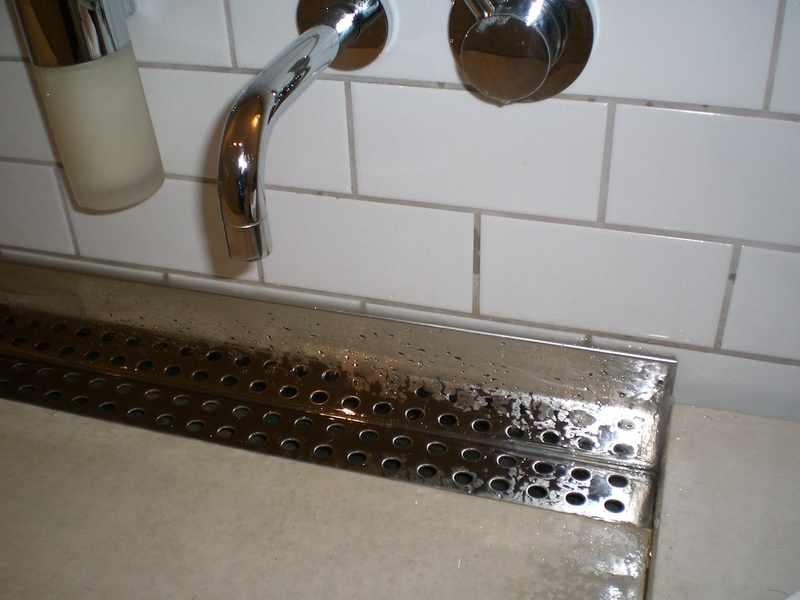 Linear drains are finding favor in showers as well. Trough sinks are also gaining popularity in kitchens. Allison found a kitchen with a huge Concrete Trough Sink and, additionally, we’ve featured Trough Prep Sinks.